You’re now substituting complete, balanced amino acid filled proteins with tons of nutrients in place of your old cereals, bagels, muffins and other processed foods. This alone will relax the inflammation within your body and allow you to begin to feel healthy and reenergized again. Once your body receives the proper fuel you’ll be able to complete your day’s activities and workouts with more intensity and the results will speak for themself. Start by adding one in for breakfast or directly after your morning workout. Then, if you feel comfortable you can add another one in later in the afternoon or directly after a later in the day workout. My wife is a big fan of mint chocolate chip ice cream, so this smoothie is a favorite. I add a lot of ice and make it thick like a frappe! Okay, this is yet another one of my favorites! When I was first experimenting with smoothie flavors for myself many years ago, I thought about combining my morning coffee with my breakfast protein shake… what I came up with is this great tasting recipe. If you can’t live without your morning jolt, you need to combine the best of both worlds with this flavorful smoothie. * optional – add a drop of mint extract for a Chocolate Mint Mocha! * optional – add a small handful of espresso beans into your blender instead of actual iced coffee – this adds quite the kick! Why not take one of your favorite desserts and turn it into a tasty shake? * optional – squirt sugar free chocolate syrup along the sides of your smoothie glass before you pour in your shake. It tastes and looks cool all at the same time. If you love fruit smoothies then this is the shake for you! We all know how good blueberries are for us and now you have any easy way to get a serving or two while adding in your protein requirement for lasting energy. If you have trouble losing weight it may be from more than just excess calories and insufficient exercise. You need to make sure that you are absorbing the maximum of nutrients from your foods and not reabsorbing toxins back into your body. If you find yourself always on the run and needing a little something more out of your breakfast smoothie than you may want to give this hearty meal a try. 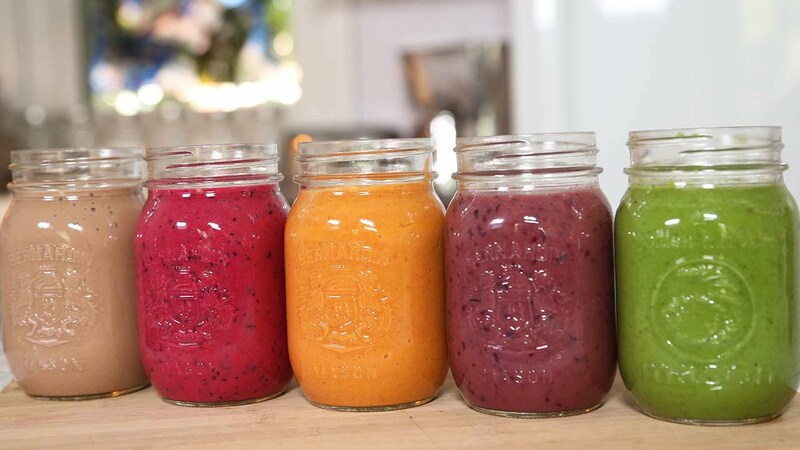 I hope you enjoy some of my favorite weight loss smoothie recipes and also feel free to play with the ingredients a little to adjust to your specific tastes. I wish much success and happiness along the way!